Growing businesses need to store, share, and analyse growing volumes of data. Every year, Stemettes organises more events and reaches out to more young girls as part of its mission to inspire the next generation of females into science, technology, engineering, and maths (STEM). We talked to Anne-Marie Imafidon MBE, Co-founder of Stemettes, about how a more strategic approach to capturing and sharing information has helped the not-for-profit organisation maximise its resources. What kind of data do you capture at Stemettes and why is it important? Tracking success is important for any organisation. For us, one of our key measures of success is based on the number of girls that we’ve helped become more interested in careers in the STEM industries. We capture this information by running pre-event and post-event surveys. Qualitative information is also important: we need to know what our Stemettes have been able to achieve, so we can talk about our successes with corporate partners and funders. These insights also help us make our events and services more relevant to our target audience. How has your approach to managing data changed? Everything used to be stored in my head! Although we did have spreadsheets, nobody really wanted to update them, as the process was so time-consuming. We soon realised this was going to be a problem as our team and remit grew. With Salesforce, we now know which events each girl has attended and how they’re progressing, so if we want to write up a success story, we can do a quick search to find a suitable candidate. Before Salesforce, we really struggled with this. We’ve also created an event app that takes girls’ feedback from events and puts it straight in to Salesforce. It’s saved us hours! We can now see at a glance how participants’ interest in pursuing STEM subjects as a career has changed following their attendance at an event. We also track feedback from girls that have been part of our mentoring scheme. Can you tell me more about the mentoring scheme? We want to nurture long-term relationships and turn internships into careers. 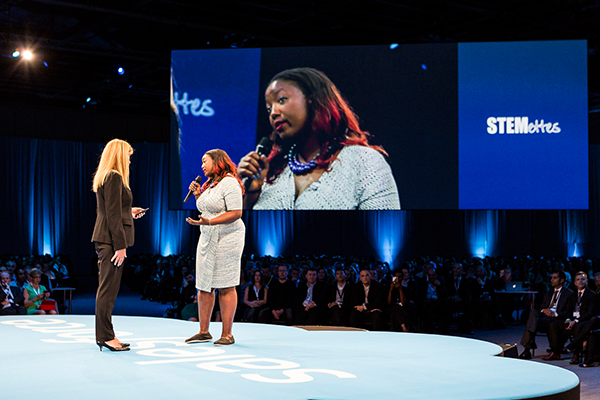 Our Student to Stemette programme matches aspiring young women with those already in the industry - like Salesforce employee Francesca Bowen who has been mentoring 21-year-old Folashade: "I'm helping her think about herself differently, opening her mind to the massive potential she has. It's a very rewarding relationship so far!" Mentees spend four months working towards tangible career goals and getting work experience, as well as having the chance to attend the Grace Hopper Celebration of Women in Computing. Salesforce is a Gold Partner of the event and Salesforce CEO Marc Benioff was keynote speaker in 2016. How do you keep in touch with the girls you’ve helped? One of the best things about Salesforce is its scalability. It’s as easy for us to keep in touch with 10 girls as it is 1,000. If a girl is interested in STEM as a career, we want to keep them motivated and inspired – every Stemette is a future role model. We also use our app, which is called OtotheB, to engage with the thousands of girls that have attended our events. The app logs survey responses following an event, and provides access to a range of experiences, including work shadowing Salesforce employees as part of the company’s philanthropic 1-1-1 model. Every time a girl responds to a competition, campaign, or offer, it’s linked back to her profile in Sales Cloud. How important is it to have mobile access to your data? It’s essential – the team spends a lot of time at events and in meetings. With the Salesforce1 Mobile App, we can access a range of information from profiles and contacts to tasks and event checklists. It helps our team maximise their time and have more informed meetings with sponsors and partners. 2017 will be an incredible year for us, continuing on our journey with Salesforce. Our 2015 collaboration with Salesforce was Outbox Incubator and we'll be releasing a documentary about the project called Eat. Sleep. STEM. Repeat. - the very first preview will simultaneously be at Salesforce Tower in London and Salesforces offices in Dublin, for a small audience of influencers and Salesforce employees. By mobilising and centralising its data, Anne-Marie and her team can spend less time on administration and more time on inspiring a new generation of female engineers, scientists, technologists and mathematicians. Read the full success story to learn more about how the Stemettes team is using apps and analytics to help more girls realise their potential.